Tart juice punches up the silky milk chocolate hidden within. 1. In a double boiler, melt the milk chocolate and butter together. 2. Mix in the passion fruit juice. 3. Remove from heat and transfer to an airtight container until ready to assemble. 1. Mix together flour, brown sugar and butter until they form a ball. 2. Press dough into a disc and wrap with plastic. Refrigerate for 30 minutes. 3. Once chilled, roll the dough to 1/4 inch and using a round cutter and cut out the dough and place on top of your piped choux. 1. In a saucepan, bring milk, sugar, salt and butter to a boil. 2. Remove from heat and stir in flour. 3. Place pan back on medium heat. Stir for 1-2 mins until the dough forms a smooth ball and pulls away from the sides of the pan. 4. Place dough in a bowl and mix on low with the paddle attachment for 1 minute. 5. Increase the speed to medium, and add the eggs one at a time until fully incorporated. 6. Scoop the dough into a piping bag with a 1/2” tip. Pipe the dough into 1 1/2” round in diameter. Add pre-made sugar crust. 7. Bake for 10 minutes at 375°F. Lower to 300°F and continue to bake for another 25-30 minutes, until pastry is golden brown. 8. Turn off oven and open the door halfway. Let pastries cool for 30 minutes inside. 9. 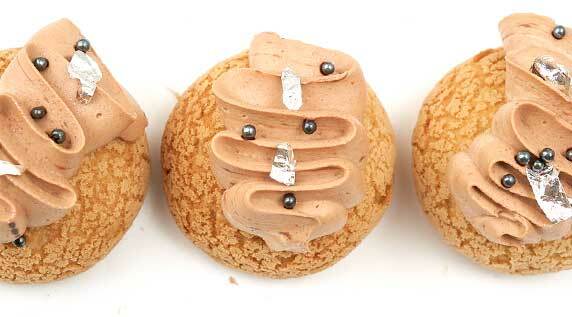 Once cool, whip ganache and pipe into choux.